Any chance we could get you to provide a v7 file as well? v8 should be faster. Why not just test with that? Can someone please save this back as v7 for me? Thanks! RZ is registered, so i have no idea what is wrong? yep. imager seems to be very crashy here as well. every third time i had a crash when starting up. when it works, after adding the scene and switching to a different rendering type, sometimes it 'freezes' again. i never noticed this instability as i'm almost never using this part of FZ. OSX 10.9.5 here. It looks like you do not have a good installation of the Imager. If you delete your current formZ Application folder and replace it with one downloaded from here, does that restore RenderZone for you? If that is not working, try resetting the prefs by going to the Finder: Go Menu: Holding down the Option key, choose Library: Preferences: autodessys -- and deleting the formZ 8 Imager folder. We have found one issue with formZ v8 on Yosemite (OS X 10.10) whereby clicking in the blank space of the Tool Option: Parameters Palette (if it is inside the Palette Dock) can cause a crash (and just using Tab or Enter instead of clicking will avoid the issue -- and this will be fixed with the next update coming soon). Other than that v8 should be more robust and more stable than v7. The new Subdivision Surfaces are great, but even if you don't need those, the improved Shaded Full display is quite nice. Here's an example of the Shaded Full mode for this file, which you can easily navigate in real time for generating animations, or doing client walk-through's. I'm getting the same problem as Markus and R2D2. RenderZone option does not show in imager. I can load the file into formZ and use Renderzone there, but Imager doesn't seem to see the option. Resetting preferences doesn't fix it, though I have not yet tried a complete re-install of formZ. Since I never really use Imager I've never noticed it before. 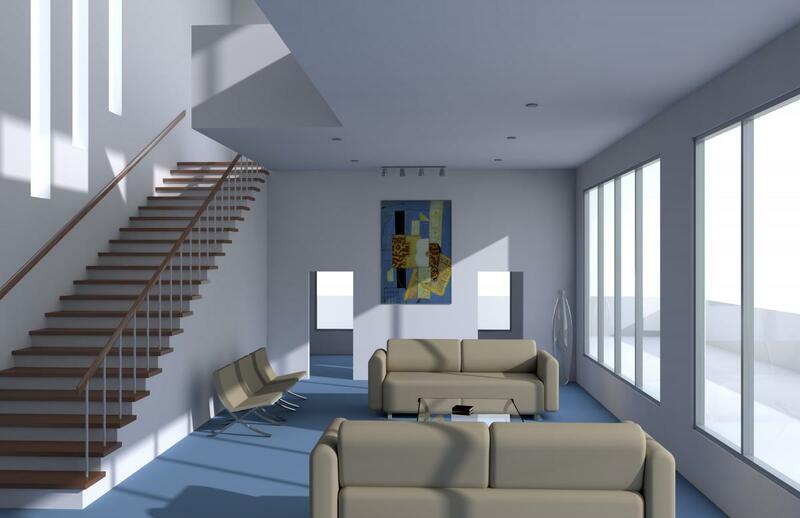 Imager will run a hidden line render, but crashed when I chose all shaded full radiosity. Will try a few of the others to see what happens. Re-installed. Renderzone option now shows up but Imager "hangs" as soon as I hit Generate. Nuked the preferences folder. Still "hangs". Dialog box goes grey, but then nothing happens. System monitor shows formZ using only 1 core. Within formZ itself if I run render zone it shows using all cores. Glad reinstalling solved the Imager issue. Note that "Not Responding" does not mean there is an issue -- it just means that the program is not talking to the system at that second. Imager did not render file. Just a grey screen showed with no results? Did you allow enough time for the rendering to complete? Did it again attached are results. Thought it would be about 16 minutes. Would nice to have a progress bar in imager window. Yes, we will see what we can do to add a progress bar to the imager. I will have to reinstall here as well. Same problem with Renderzone not showing up as an option. Hmm.. I hope these installations problems disappear with the next update. They leave a bad taste in people's mouths. Just my five cents. not sure what is wrong here, but it is rendering already over one and a half hour on my system. no idea how long exactly, but all cores are processing... gonna stop this now - seems this is way over what time should be expected seeing the other results. OSX 10.9.5, mac pro mid 2010 with 2 x 6 cores xeon X5650, 2.66 ghz, 48 gbyte RAM, nvidia gtx 780 card, 256 gbyte system SSD. EDIT -- Markus, regarding your last post, I wonder if you are having a multi-threading issue, as we would expect your render time to be higher. 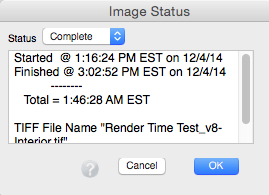 If you go to the Imager Preferences and set the # Processors to 6, does that improve your render time? I'm not sure why, but your memory is only showing at 800mhz. That is really slow for DDR3 memory. If I were you, I would pull the ram and check to see if it is rated at faster. It should really be 1333mhz for best performance. If it's only rated at 800mhz, your slower memory is likely bottlenecking your system, and should be replaced with 1333mhz ecc DDR3. whatever manual setting i use 6, 12 or 24 processsors, the program is only using a very small part of 'user' CPU potential. just as an experiment, i did a fast - quick and dirty - conversion to lightwave in 2 minutes. export from FZ8 as layered LWO with textures. almost no material tweak or optimization, just replaced the default glass with a nodal glass material and added a bit of soft reflections on the stairs and the window mullions (just couldn't resist!). then i set the scene up with a simple sun + sky environment, matched camera and sunlight and rendered it with cached montecarlo 2 bounces full raytracing, medium/high AA. We did not optimize the rendering of this specific file for time -- just to take a "reasonable amount of time" for the render test to be valid -- so you can get similar quality in less time in formZ too -- but that was not the goal for the file we set up. With the Imager set to use 6 processors, it is expected that a little over 1 processor would be used for about the first minute, but after that, you should see all (6) processors being used. Is that not the case on your computer? We did not optimize the rendering for time -- just to take a "reasonable amount of time" for the render test to be valid -- so you can get similar quality in less time in formZ too -- but that was not the goal for the file we set up. the screenshot you can see is taken at the very end of the rendering process. it does not qualitatively change for all the settings i have tried.